Science Minus Details: Is the solar system tilted sideways?? Us, our planet, and our solar system...we all live in the "suburbs" of our milky way galaxy, in one of its spiral arms. 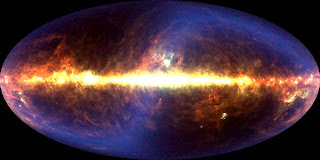 So, when we see the milky way in the sky we can gaze toward the shiny lights "downtown," near the center of our galaxy. We can also gaze at other suburbs of our galaxy, getting an edge-on view of the spiral arms. Image adapted from William Castleman. The campfire was now completely gone, and as the earth continued to turn, the milky way moved higher and higher in the sky. 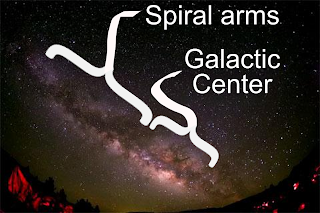 Pretty soon it was straight overhead--the spiral arms stretched above my head toward the northern horizon and the galactic center at my feet toward the southern horizon. "The milky way and I sure are aligned tonight," I thought. Pondering this a bit longer, I realized that I was laying down parallel to the plane of our galaxy. The milky way was huge and cosmically more significant than me, but my body was still oriented in a particular direction with respect to it. Crazy! Had I been laying on the ground oriented west-to-east I would have been floating in space perpendicular instead of parallel to the plane of our galaxy. Think about it! 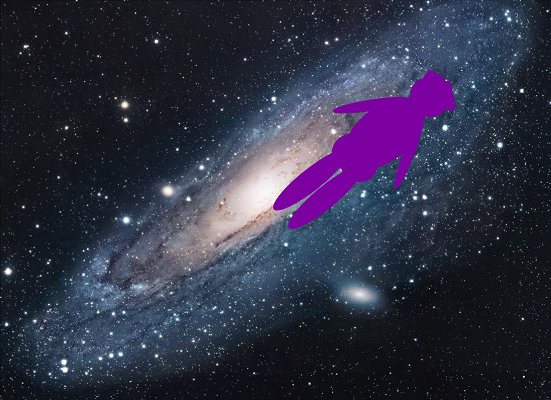 Me, floating parallel to the plane of the milky way galaxy. Not to scale. Actually this is the nearby Andromeda Galaxy. Adapted from UniverseToday. My sense of north-south-east-west was not exact, but hopefully you get the idea. I was lying roughly north-to-south...I was parallel to the plane of the galaxy...therefore the orbit of the earth and its north-south axis must also be parallel to the plane of the galaxy. The solar system and the milky way, tilted. Note: SUPER not to scale. It turns out I'm not totally bonkers, and the solar system is "tilted" with respect to our galaxy. You can see that in this 360 degree panoramic picture of the sky. Click to see in full glory!!! via APOD. In addition to the familiar band of light from our milky way galaxy in this image, you might also notice the dimmer band of light running left-to-right. This is known as zodiacal light, and is caused by sunlight being reflected off tiny dust particles scattered like a pancake in the plane of our solar system. Zodiacal light can be used to literally see into the plane of our solar system. So here you can visibly see the plane of the milky way vs the plane of our solar system, and as you can see they are tilted with respect to one another by about 60 degrees. You can see this even better in this image of the sky that was made by looking at infrared light (shifted here into the visible spectrum so we can see it, of course). Infrared image of the sky. Click it! via APOD. 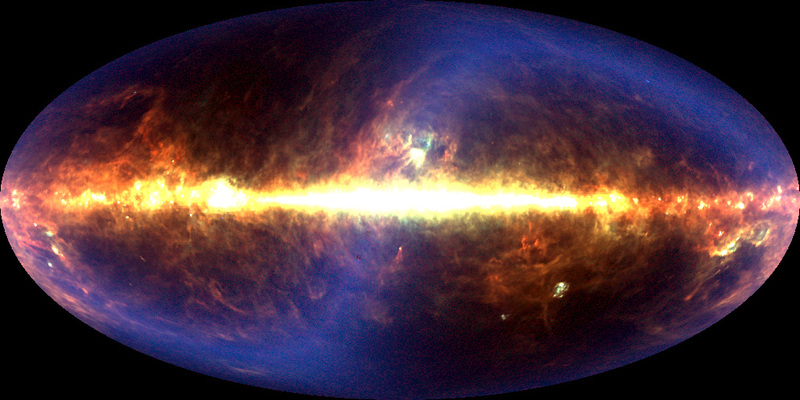 The mega-bright line from left-to-right is the milky way galaxy. It looks more bright here than in the image above because infrared light can pass through the dust that normally blocks part of our view of the milky way. The more diffuse blue-ish light is the zodiacal light from our solar system. See, we are tilted by 60 degrees! *note: The tilt of the earth's axis of rotation with respect to the plane of the solar system and earth's orbit around the sun greatly complicate this whole issue. So, to avoid entering a quagmire of celestial-mechanical-insanity, I'm ignoring it entirely. Please forgive me. If you'd like to learn more, check this confusing stuff out. Also for a different explanation of all this, go here. Because Uranus, third largest planet in the solar system, is titled on its side, seasons there last more than 20 years. Scientists think the extreme tilt was caused by a long-ago collision with a planet-sized object. That is JUST "TUKKA" a wrong belief. Many even do not know the orientation of our solar system. Our SOLAR SYSTEM is tilted with the plane of the Milky Way. Was it was caused by collision with object/galaxy? Q1) Has any one seen a photo of our Galaxy? Who photographed it? From Where? Many have seen Fake pictures. Q2) What direction the galaxy rotates? Clockwise / anticlockwise? Or Neither? Then What’s the possible direction? Q3) Our planets and satellites rotates unidirectional from west to east while Uranus is nearly 83 or 97 degree angled to all orbits (one pole - Axis face to Sun and that cannot change) but moves unidirectional from West to East, But still whole system is stable. Nothing has changed its direction of Plane. Q4) what the position of our solar system in our Galaxy? In the plane of Galaxy? / or Angled with the plane of the Galaxy? What photographic proofs we have? Are we alone in the universe having such solar tilt? No, many solar system are there like us having tilts with the galactic plane. Q5) Just like Solar system Plane is tilted (nearly 69 Degree/angle) and our SOUTH axis is towards the galactic centre and that cannot change. So what is the angle of tilt of our solar system? And How/why it got TILT? (The equator or plane of the Milky Way is tilted by about 60º to the plane of the ecliptic, the plane of the Earth’s orbit around the sun). Q6) How Long our Galaxy will survive? What is the fate of Future? What might happen in next 2Bn years? Q1) Yes, most of us have. Many different scientist took photos from the Hubble Telescope, which is located within our galaxy. All photos of our Galaxy from "our" (relational) point of view.....most people confuse photos of Andromeda as extra-galactic photos of the Milky Way. Q2) When speaking in 3 dimensional terms, rotation is a matter of perspective and (counter)clockwise is a 2 dimensional reference. You have to think more in terms of vectors and vector space. 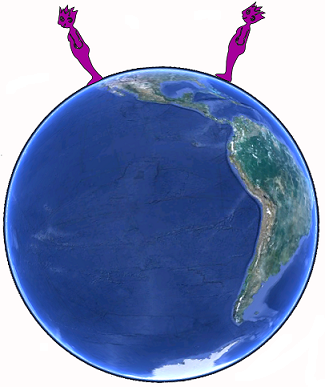 Q4) Our solar system is located in the Orion Spur (a small arm of the galaxy). Well, it depends on where we are in Sol's rotation of the galaxy, most of the time we are not even with the galactic plane, but when we pass through the plane then we are technically even with it. We don't need photographic proof in the traditional sense. We have many different images based of off radiowaves, infrared, x-ray, and host of other different light spectrums that allow us to make calculations based on what we observe in them. Q5) Again, South is a 2 dimensional term that doesn't apply when speaking in terms of space. You answered your own question, our solar systems angle of tilt compared to the galactic plane is about 69 degrees. We're not too sure as to how or why our solar system has such a tilt, there is still a massive about that don't know about gravity. It's widely considered to actually be 63 degrees of difference between the plane of earth and the plane of the galaxy, when you calculate in the Earth's 23 degree axis you get a relational 69 degree difference between the solar plane and the galactic plane. Q6) We have absolutely no idea, how does this relate in any way to the topic at hand? Ya' know, we try to get people interested in science and enjoy the fascination of the physical universe and we also strive to treat others here or elsewhete fairly and this know-it-all rectal void comes along and cruelly insults somebody with a genuine intetest in science. I hope that Anonymous from Oct 25 sticks with his/her interest in science and ignores this pompous cretin. God, I hope this guy is not a teacher ruining more curious minds. Great stuff! I was searching for the answer to this exact issue. Nice images, well done. Yay! Happy to help! Thanks for stopping by! On top of all that, I'm sure the solar system axis is also wobbling, so it might not stay 60 degrees constantly. But then, what's constant??! So...when I look 'North' does this mean I am staring in the direction of where the Earth and all the other planets are travelling around the Galaxy. I'd love to know for certain because this has been bugging me. On a flippant note. Are we there yet? Sorry. I couldn't resist. Stephen, you've got the right idea. At the north pole, you're looking outward from galactic center. Since we're on an outer srm of our galaxy, we'd see fewer stars than looking toward the center. By the way, this observation of the first minutes of a nova in a starin another galaxy took say 10,000 years for the light to get here if it was 10,000 light years away. 27° Sagittarius = "Galactic Center" or "Milky Way". 3° Libra = "Super Galsctic Center" with the central bar & spiral arms. 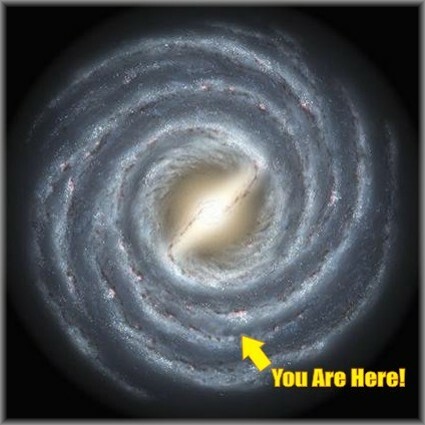 The Earth, our Sun & the rest of our solar system AND the Milky Way are ALL located at the image line which says "You are here!". Curious ( I may have overlooked what I am looking into) as to our directional vector. First assumption: Galactic North for our Milky Way is suggested because the Galactic Core is rotating clockwise? 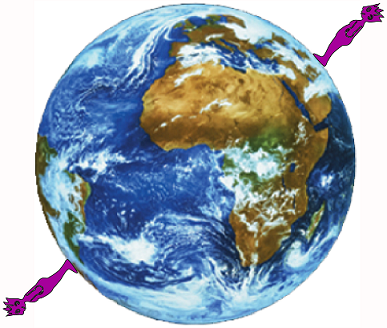 Following that assumption that we are moving clockwise around the core, which is the more "leading" side of Earth (the southern or northern hemisphere)? Thanks for your input and catching me up.